Atomos Ninja Flame 7 In. Brand New in Original Packaging. Large 7 4K screen to see every detail of your footage. Touchscreen technology makes navigating menus quick and easy. AtomHDR technology ensures HDR Log footage is displayed accurately. Includes protective Master Caddy II travel case. 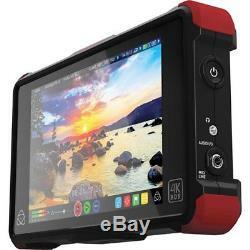 Atomos ATOMNJAFL2 Ninja Flame 7 4K HDMI Recording Monitor with Travel Case - ATOMNJAFL2. Change the way you shoot with the Atomos Ninja Flame 7 4K HDMI Recording Monitor. Record Log in 4K or HD ProRes/DNxHR from DSLR's with the Ninja Flame's HDMI input and thanks to the AtomHDR engine's combination of 10+ stops dynamic range, 1500nit brightness and 10-bit color processing you can monitor the HDR Log with vivid, natural colors. Burn Away the Fog of Log. Camera Log (S-Log2, S-Log3, C-Log, V-Log etc) delivers maximum sensor detail in your recordings, but on monitors it looks washed out & makes judging exposure difficult. The compromise for filmmakers is to use LUT's to get the approximate "look" but sacrifice detail or use calibration cards, waveform & some "rule of thumb" figures to set exposure correctly. AtomHDR is the solution, accurately displaying HDR Log footage with the brightness to see Log as the eye sees it. Scenes Ignite with 1500nits of Light. Not all scenes call for HDR Log recording. In situations that don't call for 10 stops of dynamic range, use the intensity of the 1500nit panel to monitor traditional standard dynamic range (SDR/Rec709) video at high brightness for outdoor monitoring. Simply pick the right mode, HDR or High Bright SDR, and get busy setting up your shot on the premium 7 display boasting 10-bit processing, 1920x1200 resolution, 325ppi pixel density, optional calibration to overcome natural LCD color drift and an arsenal of precision video setup tools for perfect shots every time. Get More from Your DSLR. The perfect partner for DSLR and Mirrorless cameras with Log output over HDMI. From gimbal operators to Corporate to Indy filmmakers, your recordings are instantly upgraded to the defacto standard for Hollywood, Indie & Broadcasters (ProRes and DNxHR), ensuring you're not technically rejected in Post and letting you see the detail of your camera's Log on set with natural colors on the calibrated 7 AtomHDR High Bright monitor. The combination of high capacity media with recording direct from the sensor means that the conventional 30min barrier imposed by many cameras can be bypassed. Record Professional 4K & HD. Recording 4K and high frame rate HD within the camera might seem enough but unless you record with the right codec you're restricting flexibility in post and even run the risk of having your footage technically rejected. Along with the high pixel density of 4K, the Ninja Flame records higher resolution 10-bit color information, more precise yet efficient 4:2:2 color encoding and to visually lossless, edit-ready codecs like Apple ProRes or AVID DNxHR. Now you're recording professionally, capturing full individual frames just like film and opening up more creativity in post and grading. Additionally, bypassing internal recording also bypasses the 30min recording barrier found on many Mirrorless/DSLR cameras. Our flexible OS is packed with an extensive suite of scopes, all 1-touch away and simple to use. The Video OS includes tools for focus, framing & exposure (Focus peaking, 2:1/1:1 zoom, Zebra, False Color, Frame guides, SMPTE Safe Area, Waveform, RGB parade, vectorscope) along with a flexible 3D LUT implementation use built-in LOG to Rec. Cube files and options for anamorphic de-squeeze monitoring. What's in the Box. Resolution - 1920 x 1200. Aspect ratio - 16:9 native. Color Gamut - REC709 HDTV. Look up table (LUT) support 3D LUT. Anamorphic de-squeeze - 2x, 1.5x, 1.33x, Panasonic 8:3. SuperAtom IPS panel (capacitive touch). 709 with optional calibration unit. Canon CLog / CLog 2. Sony SGamut / SGamut3 / SGamut3. Canon Cinema / BT2020 / DCI P3 / DCI P3+. Bit depth - 10-bit (8+2 FRC). Brightness - 1500nit (+/- 10%). HDR input (PQ/HLG) - Yes / Yes. HDR output (PQ/HLG) - Yes / Yes. HDMI - 1 x HDMI (1.4b). Signal - Uncompressed true 10-bit or 8-bit 422 (camera dependent). Supported Codecs & Frame Rates (Record Playback). Video to ProRes / DNxHR. 24/25/30pSF > 24/25/30p (2:2 pulldown). 60i > 24p (3:2 pulldown). 4K UHD downscale for HD monitoring: Yes - Loop-out and playback. Playlist / Genlock / LTC - Yes / No / No. ProRes (Recorded content) - All recorded files can playback. Playback in slow motion >= 100fps. DNxHR / DNxHD (recorded content) - All recorded files can playback. Pre-roll record - Yes (HD 8s, 4K 2s). Meta data tagging - Yes (10 tags available). Supported media - 2.5 SSD/HDD compatibility. Master caddy case - Master Caddy II (included). Master Caddy dimensions - 75mm x 105mm x 12mm. Master caddy dock - 2.5 SATA to USB 2.0/3.0. XML support - FCPX XML native. FCP7 supported with conversion (Adobe compatible). F There are product categories which are not returnable due to hygienic or sanitary as required by manufacturers. In an event where there is an error regarding a price error or description, we will notify you ASAP. Items removed from their'blister-pack' display packaging are non-refundable. The item "Atomos Ninja Flame 7 In. 4K HDMI Recording Monitor" is in sale since Monday, July 24, 2017. This item is in the category "Cameras & Photo\Video Production & Editing\Video Recorders & Players". The seller is "asavings" and is located in Brooklyn, New York. This item can be shipped to United States, Canada, United Kingdom, Denmark, Romania, Slovakia, Bulgaria, Czech republic, Finland, Hungary, Latvia, Lithuania, Malta, Estonia, Australia, Greece, Portugal, Cyprus, Slovenia, Japan, China, Sweden, South Korea, Indonesia, South africa, Thailand, Belgium, France, Hong Kong, Ireland, Netherlands, Poland, Spain, Italy, Germany, Austria, Israel, Mexico, New Zealand, Singapore, Switzerland, Norway, Saudi arabia, Ukraine, United arab emirates, Qatar, Kuwait, Bahrain, Croatia, Malaysia, Brazil, Chile, Colombia, Costa rica, Panama, Trinidad and tobago, Guatemala, Honduras, Jamaica, Bahamas, Viet nam.